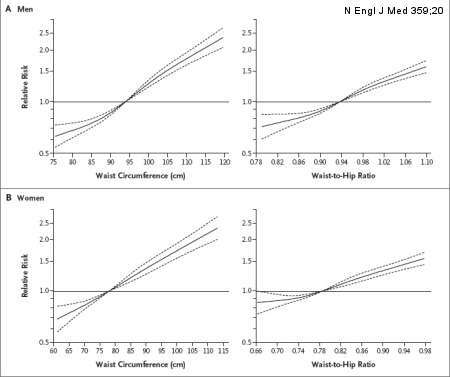 So if your male waist is 42 inches (approx 106 cm) you have 50% greater risk than a male waist of 37 inches (approx 95 cm)—if your female your risk doubles! Conclusions and Relevance: "In MZ twin pairs, higher BMI was not associated with an increased risk of MI [myocardial infarction or heart attack] or death but was associated with the onset of diabetes. These results may suggest that lifestyle interventions to reduce obesity are more effective in decreasing the risk of diabetes than the risk of cardiovascular disease or death." UPDATED 08/03/2010 CDC Vital Signs, Adult Obesity. UPDATED 09/01/2009 CDC, Division of Nutrition, Physical Activity and Obesity. Do we really need a division of "Physical Activity"? UPDATED 04/07/2009 Arch Pediatr Adolesc Med., Prevalence of Obesity Among US Preschool Children in Different Racial and Ethnic Groups. Eighteen percent of our four-year-old children are chubby enough to be classified as obese? "The prevalence of autopsy-determined coronary atherosclerosis among US service members was 8.5% in our study population. Older age; lower educational level; higher BMI at military entrance; and prior diagnoses of dyslipidemia, hypertension, and obesity were associated with a higher prevalence of atherosclerosis." Collection of these types of data indirectly point to the potentially significant benefits of systematic and routine autopsies performed by competent, certified and medically trained coroners across all our states and counties (autopsies performed by funeral directors, politicos or farmers etc. are useless). UPDATED 08/03/2010 NYT, Obesity Rates Keep Rising, Troubling Health Officials and UPI, CDC: 9 states have 30 percent obese. UPDATED 01/30/2010 UPI, Overweight elderly less likely to die. UPDATED 04/27/2009 Reuters, FEATURE-Obesity becoming U.S civil rights issue for some. UPDATED 04/27/2009 BBC, Fatty foods ''offer memory boost''. Before refrigerators, (aka fridge and icebox) it wasn't so easy to remember where to find the food—now, for much of the world, it's not so easy to remember what food is in the fridge! UPDATED 04/08/2009 NPR, Fat Could Help You Lose Weight â€” Someday. 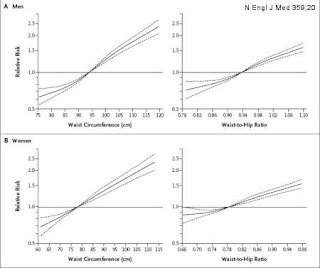 Researchers conclude that the ratio of waist-to-hip circumferences, in addition to Body Mass Index (BMI), is a risk-predictor of death.